OK so I posted this in another thread but decided I would make a new thread on it. I drove the camper to KQ and it had some issues of idling when coming home. I parked it for 2 weeks without starting it at all. Friday I went to drive it to get it registered and it would not idle at all. Give it some gas to keep it idling and it will stay running for a bit then die also. Unless the RPMs are really high, it will die. At high RPMs it does not sound right at all either. Not the normal purr but kind of like it is missing every once in a while. So last night I decided to look into the things that Dan had said. Points are new, condenser is new, coil is new, plugs were replaced before it was shipped out here. I checked the valves and they were all good. I checked the timing and it was fine also. I now have to redo the timing since stupid me forgot to tighten the clamp and I bumped the dizzy. So when I had the timing light on, it would every once in a while not light up and you could hear it miss. So the only things to check now is the cap, rotor, and wires correct? I mean the timing light should always light up right? meaning when the number 1 wire is sending the spark to the plug. Not constantly. Details on distributor and timing? Re: idling... pull the "jet" on the side of the carburetor, it has to do with air-fuel mixture. This jet's hole is very tiny and can get plugged up with any spec of dirt or old fuel drying up. Take a strand of wire and shove it through the tiny hole to clean it. Often that is what keeps the car from idling. 6v vacuum dizzy. How do I know it is 6v? Because the hole for the condenser plug is round which only 6v condensers come in. 12v is square. Timing was set to 10* BTDC. That is all I can say right now since I do not have the bus here at work. Thanks Ivan. A friend of mine said to check the carb (jets) since the bus was sitting for 3 years and it was not rebuilt before getting it on the road. Also since it was sitting for 3 years, the junk in the tank could have gotten through to the carb. Try some spray carb cleaner and see if it clears any blocked areas. Missing would not be caused by plugged idle jet. 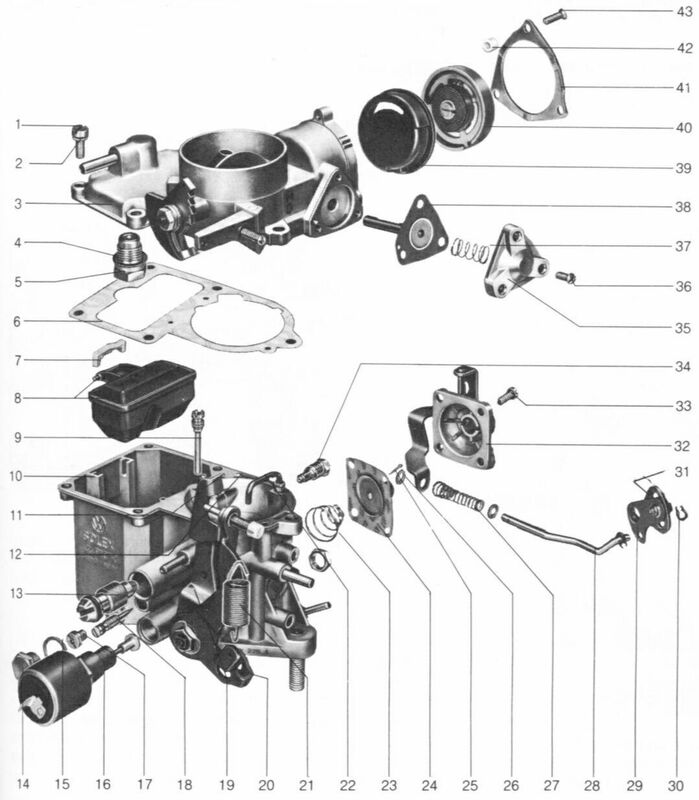 Does your carb have the electonic solenoid? If so, put the ignition on and then unplug an split it back on and listen for a click, no click, its bad and will cause no idle. As for the miss, the new condesers they sell today are garbage, but that ha s mostly been an issue with the older cast iron mechanical advance distributors. However, if your condenser has no markings on it and is gold it's trash and could be the culprit. The jet I mentioned will not get cleaned with carb cleaner! That's why I use a strand from a wire to run it through the micro-hole. I can't remember but I believe it does have the electronic solenoid (#14 right?) so I will give that a try. I got the condenser from Autozone when I had the other issue where it would not start. It problem is crap and I should change it out. So it looks like Ivan had the correct thing to check and clean. I pulled it and cleaned it up as he suggested and put it back in. Started it up and she idles again! Stoked since now I get to drive it again and next Friday I will drive it to AAA to finish the registering. But what the hell do I know! Argh, I'm having the same problem wi my new Brosol 34-3 PICT. I pulled the jet and blew compressed air through it and you can see vapor shooting out so in theory doesn't that mean it is unclogged?? I also shot carb cleaner through it and there is a steady jet. The stupid thing will still not idle though. The idle circuit is totally jammed because I cannot get it to run right until the main jet kicks in. Next time you need a "new" 34-3 PICT I'd suggest you contact Tim at Volkzbitz on the Samba. He sells rebuilt German 34-PICTs that look gorgeous and run great. He has excellent feedback. I have one and it has been perfect. So not only did I clean the jet, I also cleaned the carb where the jet goes into. Not sure if you have tried that (I am sure you did) but thought I would mention it. Well, basically, you name it and I've prolly been through it at least twice! Whether stuck in the middle of nowhere or having to get your ONLY vehicle ready to go to work in the morning, you just have to figure it out! Not to mention I've been at it since way before algory invented the interwebs and EB came up with thedrambadotcom. Here's an extra "tip'O'the day": if you have so much crap in the fuel tank that it keeps clogging the filter to the point where nothing comes through and now you are stuck on the side of the road, swap the hoses on the pump and crank the engine some. The reverse flow will blow out whatever it was clogging the line. I did NOT read that in any book! You're welcomed! Yeah! I was on my way to happy hour bowling night and at first thought to call tripolay and miss out on bowling, but then figure out to reverse the lines and was back on the road within a couple of minutes! I blew compressed air into it and it seemed to help a bit but then went to hell again. I think I might have to tear the stupid carb apart and clean it. There must be some bit of crap rattling around in the idle passages.